You see a lot of this type of story. Amish-helping-English or vice versa. “Feel good”, though usually a bit boring (the headline tells you all you need to know). Still I’m glad these stories are out there. Good news when a lot of what qualifies as news is downright depressing. When the concrete two-story silo at DaMar Farms toppled over early Sunday morning, David Sigel wasn’t sure how he would salvage the tons of silage stored inside. Luckily, neighbors, including English and Amish farmers, were ready to step in and help. On Tuesday morning, after his insurance company gave him the go-ahead, more than 25 Amish men began pulling the concrete remains away from the silage — fermented grass and other foliage used as cattle feed — that now lay across the ground behind his barn in Homer Township. How often do silos topple? This one came down after it was freshly filled. The owner’s wife described it as looking like the “leaning tower of Pisa” prior to the fall. Joe Keim, one of the Amish men who lent a hand Tuesday, said he had never seen a silo come down before. “It’s a good thing no one was under it,” he said. Levi Mast, an Amish man who lives across the street from the Sigels with his wife and three children, said he was surprised because he had spent many years working at the Sigels’ farm in and around the silo. Obviously, this was a rare event. Farm life presents its own set of dangers. 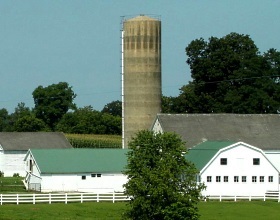 Panoramas of places like Lancaster County feature lots of silos climbing skyward (I think of these views as “Amish skyline” shots). Which makes me glad this type of thing seems to be rare. I’ve probably just got an overactive imagination. Thanks for sharing this story, Eric. I’m researching my next book, which will deal with this topic of Amish helping Englisch when disasters strike – for example in Bastrop, Texas and West, Texas, and Moore, Oklahoma. It’s a side of the Amish that not everyone is aware of. Before moving to West-Central Indiana, I was a fireman in a rural community in Northeast Indiana. Farming is very dangerous. We had special training just in agricultural dangers and injuries. It is very dangerous to go into a silo or grain bin, as the contents can shift. If the container is being emptied, a person in it can be pulled under the contents. The only time I was involved with a silo was when one was on fire. The contents had been burning for a day or so before the farmer called us. I was working in the station, coordinating responses from other departments, when the fire chief specifically called me to the farm. I was one of the skinniest firemen, and, if I can say so without bragging, one of the most level-headed. He wanted me to either drop down into the silo to deploy a spear-like device on the end of a hose to get water deep into the smoldering contents, or to man the rope while he dropped into the silo. I had never been in a silo and did not know my way around, but the fire chief had grown up on a farm, so he went in. I stood at the top of the silo holding his rescue rope and monitoring him. After we did that, we had the farmer begin to empty the silo. As he removed the contents, he used a skid-steer to spread it out on the ground. We then soaked it with water. We had the fire out in about 8 hours, which really surprised the insurance adjuster — he said it often took days after the fire department arrived. I think it is great the Amish help their neighbors like that either Amish or Englishers. Wish more people would do that to one another. I have an Amish friend of mine who told me that the Amish were the first to be in New Orleans after Hurricane Katrina. He said the Amish were the ones that called and told Red Cross, and other government agencies how bad the city was hit. All I know is what he told me. I used to work in a building (our former town library) which had its entrance through a (empty)silo. The silo is still there –concrete–maybe 50 years old, if not more, but the entrance was moved elsewhere (it’s now our village hall). It leaked a lot and had been repaired many times after the library was built “into & around” it. There are still many silos in the area, many on working farms, but another is in the middle of a 20+-year-old housing development. I remember when it was a farm. I’m sure the developer intended to keep the silo as “eye candy” to make the homebuyers feel they still lived on a farm. I’ve never heard of a collapse, though, and that’s quite an experience with the fire, James. I’ve heard of many people being killed within silos, so adding a fire to the mix is really terrifying! I’m grateful for these “good news” stories, too, Erik. It helps to know there are good things going on in the world amidst all the bad (and worse)! I have never heard of a silo that had toppled over. I did see a video once about a man that was trying to use a bulldozer to knock one down, which he did. Unfortunately, it fell right on top of his bulldozer. Amazingly, he survived. Good neighbor helping neighbor story here in any event.